The Filigree Monogram Medallion Pendant in Sterling Silver is a vintage-inspired piece that brings out the best in personalized jewelry. The pendant features up to three initials cut into the silver in such an artistic way that it creates a very classic look that you can wear day in and day out, as you like. The pendant is made with a slightly oval, sterling silver ring with wider edges along all four sides, which act as a frame for the filigree monogram at the center. Up to three letters fill the space on the interior of the silver border, and each letter has a decorative tail that curls and entwines throughout the design. Overall, the piece measures 28mm by 25mm, not including the bale at the top. The sterling silver is given a high polish and easily shines and reflects the light. This silver medallion has an interesting, not-quite-round shape that adds a nice visual dimension to it. It features a beautiful display of monogram letters that trick the eye into thinking it is a replica of a past-century Latin crest. 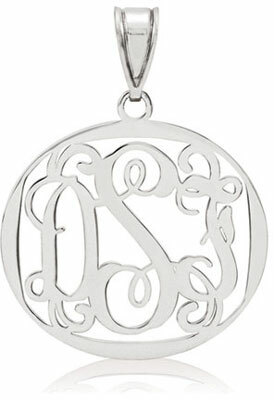 This monogram medallion pendant is a modern classic that will surely be treasured for many years to come. Pendant measures 28mm (1 1/8") x 25mm (1") not including bale. Total length of pendant is 43mm (1 11/16") including bale. We guarantee our Filigree Monogram Medallion Pendant, Sterling Silver to be high quality, authentic jewelry, as described above.